CastCoverz! 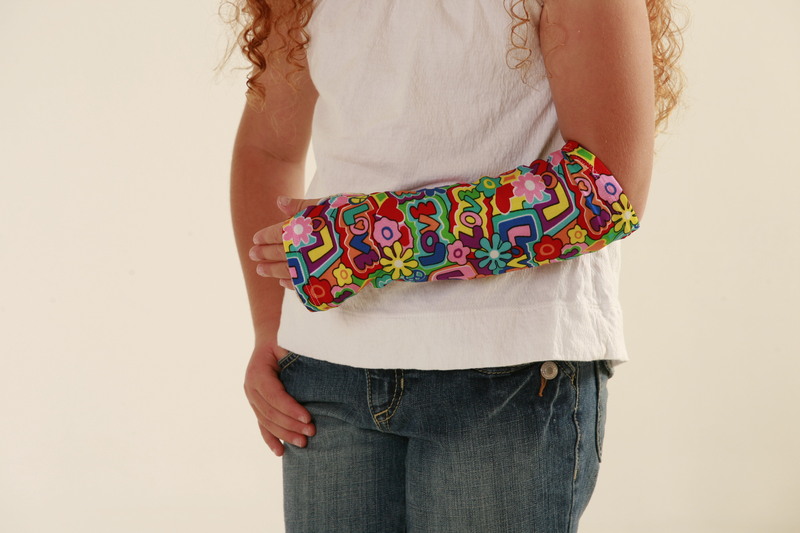 Transforms Casts, Braces, Boots and Splints with Unique Cast Covers. Accidental Creation with Fashionable and Functional Results. Keep your brace or cast clean, reduce chafing, inhibit odors, prevents snagging of furniture and clothing, and have some fun! It’s not easy to suffer a broken bone or a sprain and wearing an ugly, cumbersome cast, boot, or brace adds insult to injury. But a California entrepreneur launched a unique new product line into the marketplace to infuse some fun and function into the otherwise difficult ordeal of broken bones and injured appendages – which studies show are increasing in numbers. CastCoverz! is a functional and fashionable product line designed to cover casts, orthotic walking boots, splints and braces. Their flagship product is a stretchy and washable fabric in a range of designs that easily slip over casts and braces of multiple shapes and sizes. With styles ranging from solids to skulls, from leopard to lots of dots, from flowers to flames and so many more, CastCoverz! transforms just about any leg, arm, hand, or finger cast, walking boot, brace or splint into a fun, fashion statement. Plus, CastCoverz! are as functional as they are fun. “Dealing with the pain of an initial injury is very challenging. Adding insult to injury, casts and braces will chafe surrounding skin increasing the risk of additional infection, snag clothing and furniture, and get foul looking and smelling. Wearing a CastCoverz! daily prevents those irritating side-effects from happening,” explained Annette Giacomazzi, creator of CastCoverz! Ms. Giacomazzi should know. Her “aha” moment for CastCoverz! came after her adventurous 10-year old daughter broke her sixth (6th) bone. Putting a positive spin on the situation, Giacomazzi sewed a “stretchy sleeve” and fashionable matching sling to cover her daughter’s distorted, ugly full-arm cast. Then she sewed another cover and another sling. Friends and strangers started to rave about the novelty and functionality of the designs. At that point, realizing she might be on to something bigger, she began researching the marketplace, and concluded that the flat, commercial, uninspired product offerings of the medical casting and orthotic device industry needed, at minimum, updating. Giacomazzi also discovered statistics to indicate orthopedics is a growing market. Just in the year 2006 there were nearly 4,000,000 visits to the ER in the U.S. for fractures, alone. And studies show that children’s sports injuries – including broken bones – continue to escalate due to increased participation in organized sports. “Adults and kids alike love selecting CastCoverz! that fit their style and personality. We have many customers who purchase in multiples to change out their look. Children and outgoing adults typically prefer the “if I’ve got it, at least I’m going to flaunt it” designs; whereas modest adults prefer the more discreet or custom designs to blend in,” Giacomazzi said. “Regardless of inclination, all agree CastCoverz! products prevent the irritation, scratching, snagging, and general unpleasantness that comes with casts and orthotic devices to immoblize injuries. Simply put, wearing a CastCoverz! is a functional fashion statement for injured patients,” Giacomazzi added. In addition to the 8 products CastCoverz! currently offers plus custom work, other original products are available, too. For example, CastCooler®, an innovative product that removes the stench and itch of wearing a cast and CastShield™, an easy-on, easy-off waterproof solution for showering and bathing. CastCoverz! products, start at $16.99 for their flagship product, Armz!, are currently available at select orthopedic surgeon offices or at http://www.castcoverz.com. CastCoverz! ships world-wide. CastCoverz! is a brand of MediFAB3, founded by Annette Giacomazzi in 2009 to provide stylish alternatives to the removable medical soft goods industry. Currently in development are fashionable and functional covers for picc-bags (portable medical backpacks designed to directly pipeline nutrition and/or medications to oncology or gastroenterology patients), epi-pens and oxygen tanks. MediFAB3 serves those in an acute medical care stage. All products are professionally and proudly manufactured in the USA. "Armz!" CCZ! flagship product1 of 8 product lines...soon to be 10! Cover up those big, bulky, black walking boots!